It's another great topic for Saturday Night Genealogy Fun (but I might be biased)! (1) What were your family pets? What were their names? How long did they live? What stories do you have about them? (2) Tell us in your own blog post, in a comment to this post, or on Facebook or Google+. 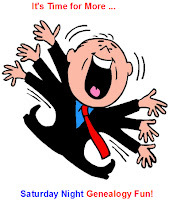 Please leave a comment on this post with a link to your post. Thank you to Janice Sellers for suggesting this topic. If you have an idea for an SNGF topic, please let me know. My family and I have had a lot of pets during my life, so I'll see who I can remember. My mother used to tell me stories about a standard poodle that we had when I was a little baby. He protected me as if I were his own puppy. His name was Pepe (which I learned from my father; my mother never mentioned his name), and he died of an epileptic seizure. This had to have been around 1962 or maybe 1963. The first pets I remember were Shazam, a solid black purebred Siamese (some kind of throwback), which we got from my dad's brother, who bred Siamese (Shazam's mother was named Ding-a-Ling); and Zeby, a German shepherd or shepherd mix whose origins I know nothing about. Shazam used to catch birds, insects, and small rodents and bring them to my mother, who freaked out and told one of us kids to get rid of them. As I recall, she just disappeared one day (one of the many reasons I am firmly in favor of indoor cats). Zeby was a pretty good dog from what I remember. She was another pet who ran away and we couldn't get her back; one day she got out of the yard accidentally. I do remember that we had those two pets while we lived in La Puente, maybe about 1966? One day the two were getting into some sort of a fight, and the babysitter who was watching us tried to intercede — not a good idea! The babysitter and Zeby got really scratched up. My parents apparently were not too good on getting animals fixed, because Shazam had a litter of kittens of which we kept one, Velvet, who was also solid black. Zeby had puppies at some point and we kept one of them, which my mother named Bubbala. Velvet was my cat and used to sit in my room all the time. One day she ran away and didn't come back. Shazam, Zeby, and Velvet all disappeared in Pomona. That would have been about 1969 or 1970. Bubbala was a special dog. It's the only time I have heard of when a vet has called a dog retarded. Bubbala never really learned to be housetrained and was always a little slow. We had him in Pomona also. I don't remember what happened to him. Other pets we had in Pomona were various small hamsetrs and gerbils, and a green snake that was kept in the garage. He was primarily my mother's pet. He got away three times; the first two times my mother was able to find him and bring him back, but the third time he was gone for good. I think it was the second time he escaped that he bit my mother when she retrieved him. I remember her staying that it hurt, but he wasn't poisonous, so she wasn't worried. I only remember one pet from the period we lived in Australia. When we were in Pagewood we had a cat that was permitted to be indoor/outdoor. She was run over by the neighbor's car. That was in 1973. When we returned to the U.S. and moved to Niceville, Florida, we had a series of Siamese cats with names evoking the devil — Beelzebub, Demon, Diablo, Lucifer, Satan, Shaitan — as chosen by my mother. One of them — maybe Demon? — wasn't very friendly with other people, including family members, except he liked me. Then one day he attackec me for some reason (I recall him being nervous because a bunch of people were in the house), and that was the excuse to find him a new home. I think Lucifer is the cat we came home and found dead in the middle of the living room, but that was after we moved to Villa Tasso. These were between 1974 and 1978 or so. Somehow one day we ended up with a small, female white cat. We went in the opposite direction with her: Her name was Angel. She was a very sweet, loving little girl, mostly mine. She appeared to undertstand what I told her in English and act approriately. We had her in 1977 or 1978, I think. There were some dogs also, although I don't remember most of their names. My mother was a bookkeeper for a breeder of show Shelties. One puppy was born with an undershot jaw, and the breeder was going to put it down, but my mother convinced him to give the dog to her. I think that dog died of a heart attack. Then there was a dachshund who loved to play by rolling over onto his back for you to rub his belly. He ran into the street one day and did that for a truck that was coming through. My mother rushed him to the vet, but he didn't make it. These were also around 1976 to 1978. The most confusing choice of pet I remember was one summer when my father came home with a St. Bernard. Remember I said we lived in Florida? Besides being the wrong dog for the local weather, Bear thought he was a lap dog and was always trying to jump up on people. As I recall, we didn't keep him long. Once I graduated college and moved out on my own, I had pets of my own. Every single one has been a rescue of some sort, with me almost always being at least the second owner. The first was a Russian Blue/Persian longhair mix I found at the Los Angeles animal shelter in 1985. I walked into the cat room, and she was the only one who talked to me, so I figured she was the right cat. Her original name was Mura, which I thought was odd, so I changed it to Tamara. She was a beautiful cat. She looked like a "luxury model" (as a friend called her), but she was a good mouser, always making sure to leave some left over for me. She was with me in my first apartment in Los Angeles, then the four-bedroom house I rented, moved with me to two houses in Berkeley, and finally to the house I bought in Oakland. Her nickname was Fuzzybutt. She lived to be 15. She had an enlarged heart (I saw the X-ray; it had grown to fill her entire chest cavity), which is what killed her. I learned how to give IV feedings while she was ill. 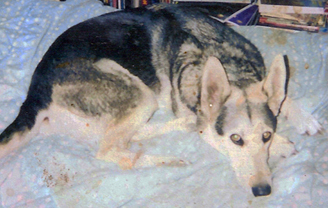 Right around 1993 my aunt and uncle somehow ended up taking care of a female German shepherd mix which had shown up in their neighborhood, probably dropped off in the country by some peabrain who simply didn't want to take care of her anymore (I was told this happened relatively often). They (mostly my uncle) didn't really want another dog, so they talked me into taking her. Cody started off being a nice dog but eventually became aggressive. I ended up surrendering her to the Humane Society with the recommendation that she be in a household with no other dogs. Then came Hank, who used to belong to a friend who had combined households with two other friends. Four cats came together, and Hank was the odd man out, not quite fitting in. He was a beautiful black and white Persian, complete with the wheezing, and a very mellow boy. His previous owner had called him "the big duh", but he was far more intelligent than she had given him credit for. I had always liked him, so when he wasn't happy in the new household, my friend offered him to me. I went to pick him up, and he was waiting on the bed as if he knew I was coming. He went straight into the carrier and was ready to leave. This was in 1996. He liked to curl up with me under the covers at bedtime. He lived to be almost 18 and died in 2011. Soon after Hank was Kirby. He was a purebred Sheltie. While I was out of the country for three and a half weeks in 1996, Cody stayed with a friend of a friend, who had Kirby, and the two got along great. Not long after I returned to the States and brought Hank home, Kirby's owner contacted me and asked if I would like to take him. She never went into detail about why she couldn't keep him anymore, but over time I began to figure out that someone had been whipping Kirby, and I suspected that she was giving him away to get him away from that problem. He was a wonderful dog. Even though Shelties are known for barking problems, he was pretty quiet. As a herding dog, he was very good at keeping the cats in line when they started hissing or fussing. He would just charge between them, almost like he was saying, "Knock it off!" As he became older he had diabetes, then became deaf and almost blind. When he started walking into rooms with a look like he couldn't figure out what he was doing there, I knew it was time. All the employees at my vet came in to say good-bye to him, he was so well loved. I think he made it to 15 also. That was in 2009. Napoleon arrived after Kirby. While my housemate and I were at the 1995 GAMA Trade Show, a cat crawled into my basement and had a litter of kittens. When we discovered them, about a week after our return, I was told by the Humane Society to start socializing the kittens so that they would be adoptable. When it came to take them to be adopted, we decided to keep the runt of the litter, a little white male shorthair. He thought he could take on the world and had a definite "superiority complex", so we named him Napoleon. 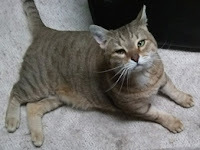 Possibly due to his ignominious beginnings in the basement, he acquired an immune deficiency and had multiple problems, including severe allergies (I learned how to give allergy shots with him). 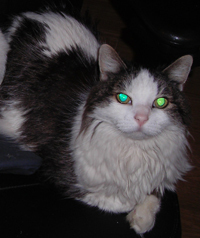 In 2000, at the age of 5 he had a stroke, and I took him to the evening emergency vet. His odds of survival were extremely poor, so I had him put to sleep while I held him. Later in 2000 a friend of mine circulated a message as a favor to a friend of his. The other friend's girlfriend had found a cat and five kittens in a laundry basket in her apartment building parking lot and had been taking care of them. She supposedly thought they were about four weeks old and was looking for homes for them, and the mother was said to be a Himalayan. I waited a few weeks to allow the kittens to be weaned and then contacted the woman. I discovered that they were only about four weeks old at that time; apparently when the lowlife left them in the parking lot, the kittens had just been born. The mother wasn't actually a Himalayan, although she obviously had some sort of "Siamese" type ancestry. (I eventually figured out she was probably a Birman.) The woman also had a dog and a young baby and was desperate to find someone to take the cats. So, I gave in. I took all six of them home with me and kept them in a closed bedroom, where the kittens could be safe. I socialized all of them really well and when they were weaned found them homes, and I kept the mother. She was a little bitty thing, but when I was able to take her to the vet, they estimated that she was about 5 years old. I named her Sassafras, Sassy for short, and she was my little fluff bucket, all long fur and fuzzy undercoat. She was always small, 8 pounds at her absolute heaviest. I adored my little princess. But after Hank died, she just wasn't the same, and she really missed me when I traveled. I came back from a trip and discovered that she really hadn't eaten for about four days, which is often deadly for cats. In her case, it was; she didn't recover. In 2003 Noodle entered my life. 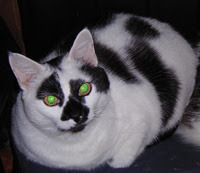 He was a black and white shorthair from the Boston area. His original name was Nunu, which I discovered was the name of the vacuum cleaner on Teletubbies, which I learned to despise when it was imported from the UK to PBS. He obviously needed a new name. If I change someone's name I try to keep it sounding somewhat similar, and my cousin's wife suggested Noodle, as in Mr. Noodle from Sesame Street, which worked for me. He was a little punk, always picking on Sassy. He moved up to Oregon with me but had heart failure earlier this year, surviving only two weeks after that. He was about 15 1/2 when he died. The year 2004 saw me branch out into birds. I had always wanted a macaw, but when I had finally saved enough money to buy one I also had a cat, and I didn't think the two could coexist. Many years later I met someone involved with a bird rescue group, and she explained how cats and birds can live together in some semblance of harmony. I met Peaches, a blue and gold macaw, at his foster mom's home, and he took an immediate liking to me. I determined that he was hatched about 2001, so he was only 3 years old when I brought him home. He's now about 17, but since large macaws live to between 60 and 80 years old in captivity, he should long outlive me. In 2005 I took in a second bird. My boyfriend at the time really wanted a sun conure, so we went to look at some in a local pet store. One of the birds had been returned after he hadn't worked out for the original purchaser (a guy who bought it for his girlfriend without asking her first). He seemed like a nice little bird. He was called Sunny at the store, apparently a very common name for sun conures, but I renamed him Ray. He was friendly and very social, and the only bird I've had that I permitted to sit on my shoulder (actually not a great place for them). The only negative thing about him is that sun conures have a rather high-pitched piercing scream, in some ways worse than macaws. I never got used to that noise. Ray took ill suddenly one day in December 2010, and I rushed him to the bird vet. They thought he had a chance, so they tried some different therapies with him, but all it did was drag it out. He died right before Christmas. The second pet to join my household in 2005 was a guinea pig named Pulga. I had gone to a local flea market just to browse and had no money with me. A man who was trying to sell the guinea pig kept trying to convince me to buy it, but I kept telling him I had no money. He finally begged me to take it, as he didn't want to have it at his house anymore. He told me her name was Pulga, which means "flea" in Spanish. Inasmuch as guinea pigs are pretty docile animals, she was a good pet. Noodle, mentioned above, used to try to climb on top of her habitat all the time, so I housed her in the bird room, which Noodle was not a big fan of (Peaches scared him). Pulga got along well with the birds and everyone was happy until Pulga suddenly died one day in 2009. Peaches was very upset and screamed for two days. I don't know if he really missed her or simply didn't like that somehing in his world had changed. In late 2006 a third bird found his way into my life. A friend of mine had asked me for advice on taking care of a bird that had been given to her daughter. 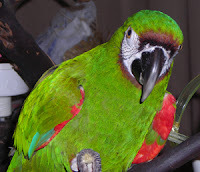 Zach was a green cheek conure. I checked out his cage and food and gave her several suggestions. Within a couple of weeks she called again and asked if I would just take the bird. Her daughter didn't want to take care of it, and she didn't want it at all. So little Zach moved in. I learned that I was (at least) his fourth owner in less than one year. This was a bird with trust issues! He was always nipping and biting at me. After a couple of years he finally figured out I wasn't going to dump him and became friendly. One morning in 2011, when it was time for the birds to get up, I uncovered his cage and found him lying on the bottom, looking very distressed. I rushed him to the vet, but he didn't make it through the day. The addition of Zach to the house brought me to my personal pet maximum. I had three cats, three birds, a dog, and a guinea pig from 2006 to 2009. For a couple of years I looked for a new bird after Ray and Zach died, because Peaches definitely seemed lonely. One day when I walked into my bird supply store, about 2008 I think, I saw a severe macaw that was listed for sale. Caesar had been returned to the store after the couple that had bought him had had a baby, becaues they just didn't seem to have time for him anymore (not an uncommon occurrence). He seemed to like me a lot and stepped up for me right away, so I checked with my vet about introducing him into the household and got an ok. I should have been suspicious, because he was being sold for only $200. It turned out that the store owner really didn't give me the complete story — Caesar is very territorial and extremely jealous, and one of the problems that the couple had with him was his jealousy over the new baby. He was absolute hell while he went through puberty, but he's calmed down a little at this point. He and Peaches have their own cages but are close to each other. When I have boarded them, I have been told that if he isn't near Peaches, he screams constantly until his cage is moved. Overall he's rather a brat, but I have assured him I won't send him back. I think he should live to be between 40 and 60 years old, so he'll probably outlive me also. The same kind of problem with loneliness happened with Noodle. After Hank and Sassy died, Noodle was moping around the house and obviously needed a new companion. I started checking out cat rescue organizations. One day I walked into the same bird supply store where I had found Caesar, and they were displaying cats from a feral rescue group. One of the cats was listed as a Himalayan. Just like Sassy, this cat didn't look like a Himalayan (he's a short hair and looks like an orange tabby with points), but he seemed friendly and responded to my talking to him. I jumped through the hoops and filled out all the paperwork, and "Brando" came to live with me. I have never been that big of a Brando fan, so I renamed him Brandy, which he seems to have taken to reasonably well. He and Noodle were the best of buddies and got along beautifully. His actual age is unknown, as he was picked up as a street cat, but he's about 12 or 13, which is definitely "old" by cat standards (don't forget, they're seniors at 7). And the latest addition to my home is Frankie, who came to live here in April of this year, just before his sixth birthday. After Noodle's heart attack, my boyfriend was concerned that Brandy would be a lonely cat when Noodle died (his prognosis had been for three months at the best) and told me about Frankie, who was in kind of a foster situation but wasn't fitting in very well. I figured it must be a sign that there was a cat that needed a home, so I said yes. He's actually kind of like Noodle, a bit of a punk. He and Brandy are still working their positions out, but things seem to get a little better every day. You've had a ton of pets and all kinds. I've only had cats and dogs. Thanks for giving Randy a fun topic. Well, most of mine have been cats and dogs; does that count? And you're welcome! Do you have any interesting ideas for topics?